Paper cutting is an ancient, elegant art that dates almost as far back as the creation of paper itself. In today's multicultural world, paper cutting embraces any number of themes, designs, and images. It is an all-inclusive art that requires few tools and minimal materials. All one needs is instruction and inspiration, both of which are found in good measure in The Art of Paper Cutting. The book includes more than 20 projects that feature a range of sizes, subject matters, and techniques. Every project features step-by-step photographs and numerous helpful hints. Author Henya Melichson has been a paper cut artist for more than twenty years. With a background in painting and drawing, Henya's paper cuts are inspired by diverse ethnic and natural motifs. Her work has appeared at museums in Europe, the United States, and Israel. A member of the Guild of American Paper Cutters, Henya has led seminars, instructed hundreds of budding paper cutters, and been interviewed for television programs. And if you want to read another review and get more inside peeks, pop on over to Craft Leftovers. And if you want another pattern from this book and a cool slider card tutorial featuring a deer, pop on over to this post. Click on the image to enlarge and read how to use bleach and wax crayon or rubber cement to mask off an area of a photo to prevent the bleach from going in that area. You can see some more examples bleached photos in this post. I did a test to see where I could get the bee in the letter "B". I got half the bee in both the positive and half in the negative. I then glued each to a card. I then went surfing the internet for some sympathy quotes. I thought the be/bee made a nice image for the cover of a sympathy card. I am going to print these out on some nice paper and glue them on the inside of the card. Then back into the Card Album for safe storage. If you have photos and want use them in your art grab yourself a copy of this book and you will most certainly be very busy making and altering them into mini masterpieces! This book teaches the reader to think of a photograph as a canvas for a wide range of artistic manipulation and coloring techniques. Once upon a time, you hesitated to even take scissors to a photo (even an imperfect one) because if you lost its negative, you’d also lose that moment in time forever. In this day of digital images and photo printers for the home computer, photographs are easily duplicated, so you never have to be concerned about preserving printed photos. You can cut, color, collage, and camouflage to your heart’s content. The photo is now an art medium that can be altered physically or digitally to create all kinds of effects. Paula Guhin is a former educator, visual artist, photographer, and the author of the ever-popular Glorious Glue, Art with Adhesives, published by J. W. Walch, and Can We Eat the Art? Her articles have appeared in School Arts, Instructor, Teaching Today, and many more periodicals. She is also a contributing editor for Arts and Activities Magazine. Shoot! I posted the wrong comment here. My question is: what kind of stone is the best for carving with a Dremel? The rocks in my yard are too hard. Well, I didn't know the answer to this question. I had only drilled one rock and it was not easy. So I typed in something like" how to carve stone." and I found this great web page over at Dremel packed full of great info. I hope this helps! I certainly learned a lot. Keep those questions coming in for a chance to win a free book and bobbin winder. There is something elemental shared among artists and crafters, regardless of chosen medium: creative energy. Crafters dabble, collaborate, muse, and make, all in their own way and on their own timeline. For all crafts, there are established techniques to follow but wild, innumerable ways to experiment, using the basics to launch crafters to new heights. Crafter's Devotional can aid that launch. Each week day is allocated its own entry, on which the reader will find a daily dose of craft content that inspires, instructs, and illuminates. Weekend entries explore topics and techniques in greater depth--perfect for enjoying on a more leisurely pace. Barbara (Bourassa) Call (North Andover, MA) is a professional writer and editor specializing in crafts, food, and health & wellness. She is the author of five books, including Beyond Scrapbooks: Using Your Scrapbook Supplies to Make Beautiful Cards, Gifts, Books, Journals, Home Decorations and More and a 4-book children's book series called Get Active! You know the saying, "keep it simple " or "less is more"
Well that's what today's inspiration is all about. Click on the image to enlarge and read about the importance of one word and how designing around it can be a great way to work. So my word is "Welcome"
With a little snarkiness thrown in....get it???? First I cut my letters out with my Cricut using Blackletter font out of just some plain black paper. Then I used the surrounding paper as my template to get my spacing right. I simply cut it out in a straight rectangle. I taped the surrounding paper onto the slice of wood along the top edge with paper masking tape (the removable kind you use when painting) so it would hing up. I adhered each letter in the spaces. Then I glued a bit of rope tied in a knot. I should also add I embellished the edges of the letters and the knot with a bit of gold ink from an ink pad. So pick a word and make something! Do you have a good homophone you like to use? And how? Leave your answer in the comments and you are entered to win a free book! If not and want to know more check out this List. There are some good ones and some I had to go to dictionary.com to look up. I love learning new things. And on a final note, if you liked this project and want to see another one I did only die cutting fabric pop on over here. More fabulous eye candy and projects made with my favorite tool-the scissors! Paper artists, papercrafters, cardmakers, collage artists, and scrapbookers are always looking for unique and exciting ways to embellish and enhance their work. The Art of Decorative Paper Stencils 2 provides crafters with a range of instruction and inspiration to create beautiful stencils inspired by your travels. Paper stencil art is a traditional craft with a long history in Japan. Kanako Yaguchi, a successful paper stencil artist, bases her new techniques on the classic methods, bringing this ancient art to a modern audience. 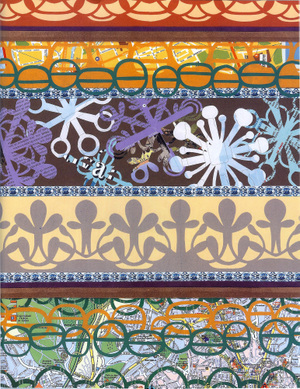 The Art of Decorative Paper Stencils 2 includes images inspired by the author's travels to Japan, the United States, Jamaica, Czech Republic, Germany, and Austria. Each project includes detailed and illustrated step-by-step instructions. There are also instructions and ideas for attractive home decor projects that reflect your travels. Kanako graduated from the Department of Design at Joshibi University of Art and Design, Japan. 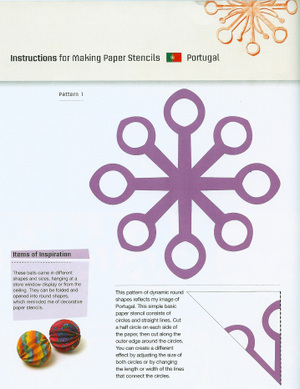 Her other publications include The Art of Decorative Paper Stencils (Quarry Books) and The Book of Decorative Paper Stencils for Adults (PHP Institute, available only in Japanese). I love this paper stencil and when I saw what Kanako's inspiration was, the vintage bowl, I just giggled because I have those bowls! This mobile made from stencils and circles of paper is so whimsical and pretty. 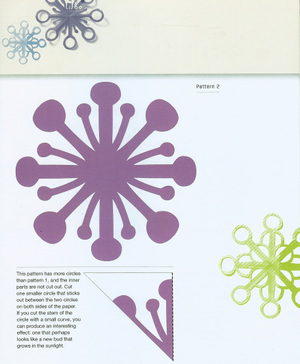 Click on the image for the instructions on how to make a paper stencil mobile. Do you make a craft or piece of art when you travel? Leave your answer and as a thanks for sharing you are entered to win a free book! Can we talk about eye candy for a minute? Paper artists, papercrafters, cardmakers, collage artists, and scrapbookers are always looking for unique and exciting ways to embellish and enhance their work. The Art of Paper Stencils provides crafters with a range of instruction and inspiration to create beautiful stencils inspired by the cultures of the world. Paper stencil art is a traditional craft with a long history in Japan. Kanako Yaguchi, a successful paper stencil artist, bases her new techniques on the classic methods, bringing this ancient art to a modern audience. 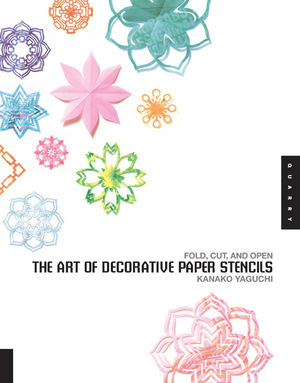 The Art of Paper Stencils includes images inspired by the author’s travels to Japan, China, Thailand, France, Portugal, and the United States, along with practical and attractive home décor projects. Each project includes detailed step-by-step instructions accompanied by helpful photography. Stencils can be used in all paper crafts in a myriad of decorative ways and can be made out of any type of paper, handmade or purchased, embellished or plain. Click on images to enlarge and download pattern. Here are my first couple of samples. I tried (from left to right) a solid piece of paper, an ad that had lots of little details, a drastic bold black and white pattern, a photo of a rhinestone broach and a closeup of a gem stone. These were all from magazine pages. I am partial to the first two but I think when I start incorporating them into my scrapbook and altered art pages they will all work in some fashion. What happened to the creative? Madge ponders the homogenization of the craft aisles in this provocative first half of a two part post. Paper is going under the knife this week at Sweater Surgery with type strips being used as photo corners on ATCs. Where does Cyndi find all those artists that are profiled on Layers Upon Layers? Would you like to be one of them? Get some power over your crafting with this tie-dyed muslin bag project. September is Ovarian Cancer Awareness month! Please take a moment to read more about a worthy project that I'm honored to be a part. Connie profiles Melinda Medeiros, the designer behind Medeiros Needlecraft Designs. Find out how to create a fun apple craft using a paper bag and a few other supplies. The finished craft can be used as an ornament, a magnet, or a brooch and it would make a great gift for a special teacher.